Photo: "DSC_7903.JPG," by Marilie Brosseau via the MEG Montreal 2008 Flickr page. This summer might've sucked with all the thunderstorms, but Montreal ain't done with you yet! This Sunday, the 3rd edition of Osheaga kicks off as the 2-day festival returns once more to its roomy digs in Parc Jean Drapeau. Big names mesh with local acts as this year's lineup features Jack Johnson, the Killers, N.E.R.D., Iggy freaking Pop and the Stooges, Duchess Says, Chromeo, Bonjour Brumaire, the National Parcs, and much, much more. With 4 stages spread across the park, there's always something playing. Watch this space as 9 (count 'em, 9!) writers bring you the goods on musicians, shows, revelers, art tents, porta-potties, food, and everything in between. Join Midnight Poutine as we catch some bitchin' music and slam back a few more (overpriced) beers before the end of summer. 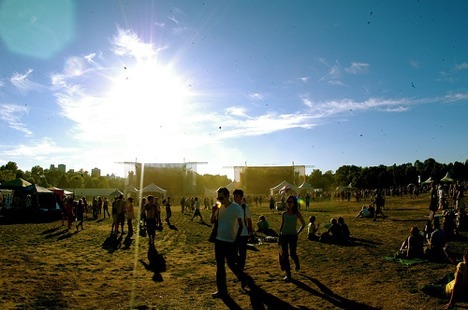 For the full lineup, take a peek at Osheaga's official website. Sisi your amazing.. well done.. can't wait to see ya again on sun..